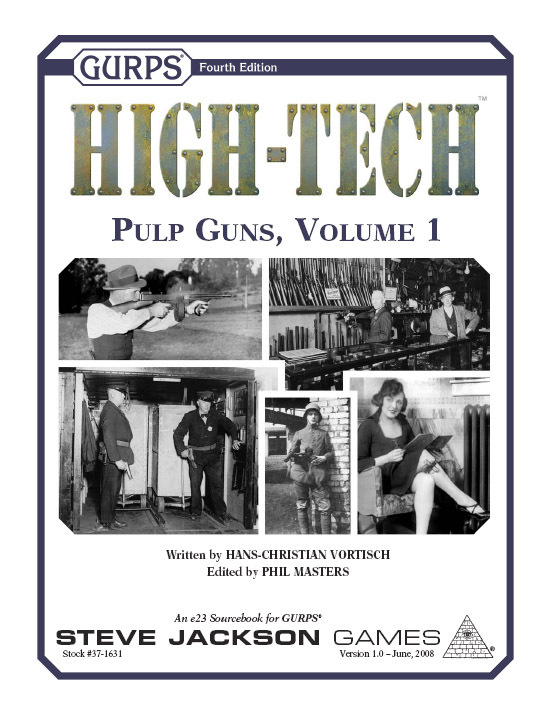 To find additional info on as well as illustrations of the firearms used during the Pulp era, first turn to the bibliographies found in GURPS High-Tech (pp. 247-248) and GURPS Cliffhangers (pp. 122-125). Many of the weapons found in GURPS High-Tech: Pulp Guns 1 and GURPS High-Tech: Pulp Guns 2 can be located in the encyclopedic works listed there. You may also want to pick up a period catalog from a particular manufacturer or, probably more useful, a large retailer such as Abercrombie & Fitch, Iver Johnson, Sears, Roebuck, A.F. Stoeger, etc. Many of the colorful quotes in GURPS High-Tech: Pulp Guns 1 and GURPS High-Tech: Pulp Guns 2 stem from such sales material. Catalogs always list period prices and many other details, and are well-illustrated as a rule. They often also feature ammunition, accessories, clothing, camping and exploration gear, and so on. Relatively cheap reprints are available from several publishers. If you want to do more serious research, the following books are just some of those that might be useful. Ballou, James. Rock in a Hard Place (Collector Grade, 2000). Extensively illustrated tome about the Browning Automatic Rifle and its variants. Goldsmith, Dolf. The Browning Machine Gun I (Collector Grade, 2005). First of three volumes on the Browning medium machine guns, concentrating on the types in use with the U.S. military, including the M1917 and M1919A4. The earlier Colt Model 1914 is also covered. Henwood, John. The Great Remington 8 and Model 81 Autoloading Rifles (Collector Grade, 2003). Detailed treatise on that rifle family. Helmer, William. The Gun that Made the Twenties Roar (The Gun Room Press, 1969). Very well-written account of the Tommy gun's history. Musgrave, Daniel, and Nelson, Thomas. The World's Machine Pistols and Submachine Guns (Ironside International, 1980). Follow-up to Nelson's The World's Submachine Guns (1963), especially noteworthy for its coverage of the many Pulp-era machine pistols. Hill, Tracie (et al). Thompson: The American Legend (Collector Grade, 1996). Profusely illustrated and very detailed book on the Tommy gun, going so far as listing the serial numbers of the entire 15,000-gun production run, with their known buyers. Swearengen, Thomas. The World's Fighting Shotguns (Chesa, 1978). Lots of details about sawed-off and riot shotguns. War Office. Textbook of Small Arms (London, 1929). An official manual on the small arms available in the 1920s, highly technical but useful. Available as reprint. Zhuk, Aleksandr. The Illustrated Encyclopedia of Handguns (Greenhill, 1995). Depicts practically all handguns available during the Pulp era, including hundreds of copies and variants. To see the guns in action, check the filmographies in GURPS High-Tech (p. 248) and GURPS Cliffhangers (p. 126). These list many of the visual references mentioned in GURPS High-Tech: Pulp Guns 1 and GURPS High-Tech: Pulp Guns 2. The others can be easily found using their titles and directors.